I bought a UTG heavy duty bipod the other day for my .22WMR bolt action and liked it so much I bought one for my 10-22 also, forgetting that the 10-22's standard stock didn't have a stud to mount it to. oops. I corrected that error by grabbing this basic Hogue stock that incorporates one and keeps the rifle looking more traditional. I really don't like .22s that get drastic "tacticool" modifications added to them. It's like putting a rail kit on an otherwise bone stock Yugo just to impress people. At the end of the day it's still just a stock Yugo, and it's still just a .22LR that's good for plinking and filling the stew pot and not a whole lot more. Can't you just add a bipod stud to the 10/22? Today bought some stuff on Amazon to 'try out' or experiment with. I just bought a 'sample pack' of slip 2000 cleaning stuff. Never used it before but want to try it out. Also got some Web Dominators [10 pak]. Not usually considered firearms related but I'm going to try them out to tie up the extra slack in my VLTOR and MAGPUL quick adjust tactical slings. When storing the rifles I like to have the slings mounted but pulled tight against the rifle so they don't get inter-tangled. Also got two 10 ft rolls of different red colored 1/8 inch bungee cord and plastic cord locks in black. How's that firearms related you ask? 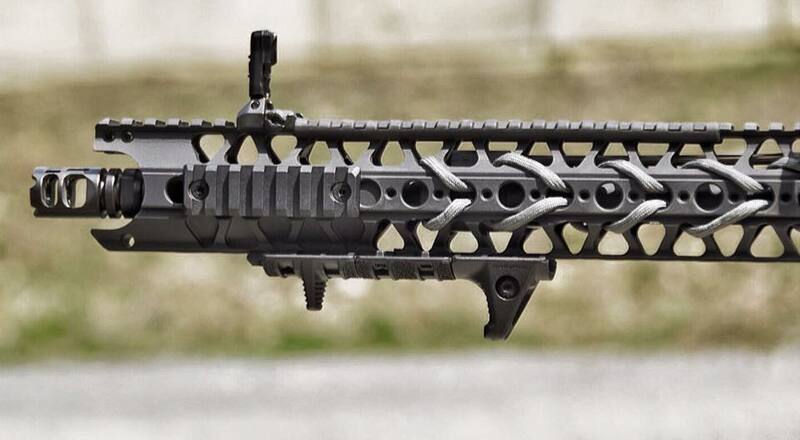 I'm going to try webbing them in on my SBR's MLOCK front rail as a accent color, like the LVOA-C, only in bright red. Just to see if it makes my SBR more dangerous. Will probably add something utilizing it to the MFT Minimalist stock and then another on the optic holding the lens covers onto the optic to balance out the accents. What's the melting point of bungee cord?!? It's all on the same Amazon order. The practical application is supposed to be as grip enhancer, inverted vehicle bipod, survival situation extras. We'll see if it does anything better than cheaply accent my rifle. I could have, but for about $50 more I get a better stock that doesn't use a barrel band. While free floating the barrel on a 10/22 will have a pretty minimal effect on the accuracy, every little bit counts. That cord you're planning to add to your rifle is probably going to melt and smoke once the barrel heats up. Nylon (outer sheath of that stuff) melts between 400 and 500 degrees Fahrenheit (roughly, depending on the particular type of nylon) and your barrel can easily reach that temp. Happenstancially, I just added some QD studs to my 10/22 for the purpose of a liberty training rifle. I had all sorts of plans when I bought the thing, but aside from the studs and bodging a way to get both a piece of rail and Tech Sights (my mod predated Tech Sights having a sight setup for just that) I've done exactly none of it. I'm thinking its not an issue because of the forgrip venting so it doesn't get near as hot as the barrel, I mean we have all held them in our bare hands while shooting. I'm trying to find info on that to verify because i have thought about it. But if you were to buy a War Sport Industries LVOA-C, it apparently comes with the bungee and there's nothing special about it. They must have tested it, and it wouldn't touch the barrel only the forgrip. Tactical Nylon polymers [what grips are made of] have a similar melting point, so the forgrips made from that would melt also if that vicinity got that hot. Picked up a Kel-Tec RDB and a Vortex red dot. Just paid for an M&P 12ga sabot slug mold. His molds are pieces of art. This one is a double cavity hollow base slug ment to be loaded in a shot cup. It is a clone of lymans mold. Bought some ammo for the first time in...a very long time. 9mm and .308. Some more factory G21 mags, and a few Kriss extensions. Picked up a Texas Rifle Co. Raptor ambi charging handle for my AR today. It replaces the Blackhawk latch less one I had on it previously. Also found a new local source for Class 3/NFA stuff as well as regular firearms today as well. Ordered a SCCY CPX-2 9mm Pistol from Palmetto. It was on sale for $169.99 with free shipping. Comes with two 10r mags. The web says it’s a fairly reliable gun once it’s broken in. And it has a lifetime warranty. I also like how it was designed and built in the US. I bought a .44 special Charter Arms Bulldog a week ago to go with my 1911 .45. I havent shot the 44 yet. Anyway my last purchase was last night. I bought the .44 Pacymer grips online. The reason for the grip upgrade is the pistol is small and I want ammo that will produce a muzzle velocity around 1,000 fps. Not a pleasant combo. But the hot loads will only be for under the pillow loads, not target shooting! I have a box of CD that would be ok for almost all situations, but I like more power in a potentially life and death situation. If I have to use hand loaded ammo to get the self defense rounds to around 1000fps, I want to keep chamber pressure close to the 15500 psi recommended. That said I may not need hand loaded stuff. I just read (speer) Gold Dot Factory loads push the .44 bullet to a claimed 900> 1045 fps...... Any comments recommendations etc ??? There's a dedicated firearms forum. Might get better optics for your question there. I generally dislike this and other buzzphrases, but the pun was too much to pass up. Moved, thanks to your friendly neighborhood moderator. I got a snubbie. CA .357 Pug. Half-case, holster & speedloaders on the way. It's been awhile since I had a wheel gun. 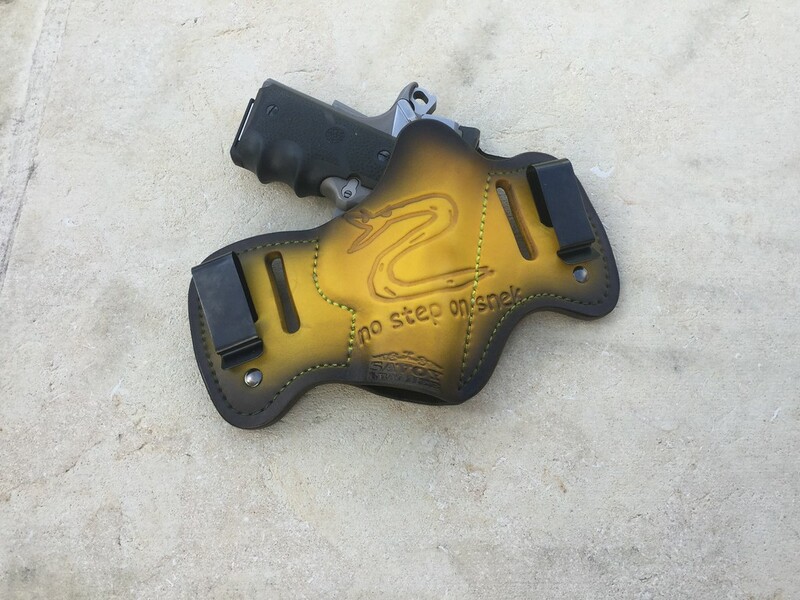 DeSantis Nemesis pocket holster for my LCP II. The one it came with wore out already. edit 3/6/19: They called my house yesterday while I was asleep to ask about the email canceling the order and my wife told them to just ignore it and send it. (She was having a migraine and not thinking clear) So they shipped it... by USPS first class mail. Big no-no that one. Small arms ammo is a prohibited item. No way am I accepting that package. I already went on the USPS site and told them to hold it at the post office. When it gets there I'm going to talk to the customer service manager there about it. I was a bad monkey this weekend. I now own (what is most likely) a police trade-in Sig Sauer P226 in .40 S&W that's in some pretty fine shape. And which I got for a pretty good deal. PSA had their "No Step On Snek" lower receiver back in stock. I couldn't help myself and bought one. Also found an appropriate bag to keep the Pc9 warm, at not local surplus store.